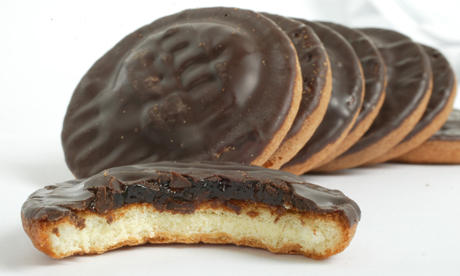 Jaffa Cake is a unique treat that is popular in the UK. It consists of an almost sponge cake base, topped with a thin layer of orange jelly and ultimately coated with chocolate. Although this ice cream does not have any cake pieces in it (that would have been perfect! ), the smooth and refreshing orange ice cream together with the decadent hot chocolate fudge sauce will make you feel as if you were standing outside of the Buckingham Palace on a beautiful summer's day. After an hour, return the mixture to the stove and on low heat, scald the mixture once again. Remove from heat and strain the orange peel and start to temper the egg yolks with the mixture - pour in about 1/4 cup of the milk mixture into the bowl with egg yolks and keep on whisking. Continue 2 to 3 times more until you could feel the mixture in the bowl getting warmer then pour the yolk mixture into the saucepan. Return to low/medium heat and keep on whisking until it thickens and becomes a custard. Leave the custard to cool in an icebath or at room temperature. Once cooled, if there are small lumps in the custard strain it using a fine mesh strainer. If you have an ice cream maker, pour the custard into the ice cream maker and let it churn then transfer into a container and freeze until ready serve. If you do not have an ice cream maker, pour the custard into a deep plastic container or baking dish and put it in the freezer. After 30 to 45 minutes, check on the mixture whether it has started to freeze around the edges. If it has, take it out of the freezer then stir a few times using a spatula or a hand whisk to break up any ice crystals. Return to the freezer. Continue checking and stirring the mixture every 30 minutes until it has frozen which might take about 2 to 3 hours to freeze completely.